Writing in 1539, John Calvin described Martin Bucer as a man “who on account of his profound scholarship, his bounteous knowledge about a wide range of subjects, his keen mind, his wide reading, and many other different virtues, remains unsurpassed today by anyone, can be compared with only a few, and excels the vast majority.” Calvin wrote these words during his three year stay in Strasbourg (1538–1541), where Bucer was a prominent Reformer. After his arrival in the city, Calvin lived for a time in Bucer’s house before moving into a house with a back yard that abutted Bucer’s back yard. During this time the two Reformers became close, and Bucer greatly influenced his younger colleague. Yet in spite of the close connection between Bucer and Calvin, Bucer remains something of an unknown for many Reformed Christians, relegated to the role of a secondary Reformer. 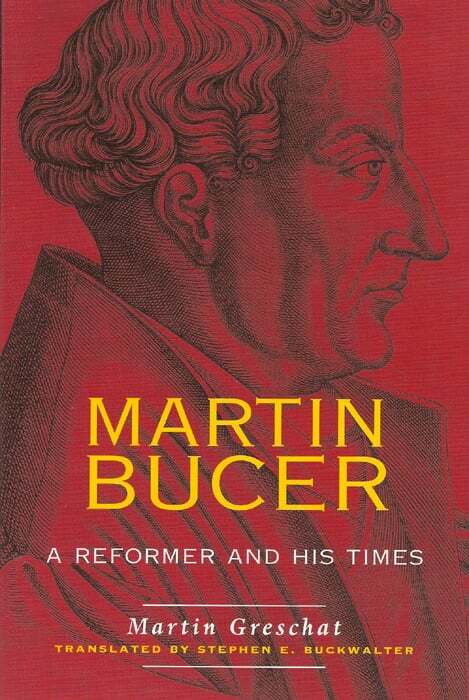 Martin Greschat’s biography of Bucer was originally published in German in 1990. It’s translation into English by Stephen Buckwalter and publication by Westminster John Knox in 2004 makes it the first biography of Bucer to appear in English in seventy years. Martin Greschat is University Professor of Church History and Contemporary Church Affairs at Justus-Leibig-Universität Giessen, Germany. He has written a number of scholarly articles on the life and thought of Bucer and is well qualified to write a full length biography. Martin Bucer was born in1491 in the city of Sélestat, an imperial free city in Alsace (today in northeastern France). He joined the Order of Preachers, or Dominicans, as a novice in 1507. After a year, he took vows of poverty, chastity, and obedience, becoming a Dominican monk. The initial stage of his studies consisted of in-depth study of Aristotle. The Dominicans considered the study of Aristotle as culminating in the study of theology, and Bucer followed this educational path. He visited Heidelberg in 1515 and Mainz in 1516 to continue his biblical and theological studies. While at Mainz, Bucer was ordained a priest. In January 1517, he returned to Heidelberg in order to obtain a university degree. In 1518, an event occurred in Heidelberg that would set the course for the remainder of Bucer’s life. In April 1518, Martin Luther came to Heidelberg for a disputation. Bucer was present. In his disputation, Luther “asserted man’s incapacity to do good, denied free will, set forth a new understanding of theology based on the cross, and proclaimed salvation by faith in Christ alone.” Bucer showed particular interest in Luther’s first thesis: “The law of God, the most salutary doctrine of life, cannot advance man on his way to righteousness, but rather hinders him,” and his twenty-fifth thesis: “He is not righteous who does much, but he who, without work, believes much in Christ.” Bucer agreed with much of what Luther said, but he had a broader view of the law. Christians, he argued, relate to the law in a new way. Bucer’s understanding of the law, as Greschat summarizes it, is that Christians “consent to it in their hearts and are moved by the Holy Spirit to live and behave according to it” (p. 28). Bucer realized the implications of his agreement with Luther. On April 30, 1518, he drew up a formal will and an inventory of all of his books. In 1521, Bucer received a dispensation from his Dominican vows, and in 1522 he married a former nun, Elisabeth Silbereisen. In May of the same year he accepted the call to be the pastor in the town of Landstuhl. After working for Reformation there for six months, Bucer came to Wissembourg in November 1522. Bucer preached the doctrines of the Reformation relentlessly. This did not sit well with all of the city’s inhabitants, and opposition rose. Eventually, Bucer was excommunicated, and the town council asked him to leave the city. It was in this condition, as a penniless, excommunicated refugee priest, that Bucer arrived in Strasbourg in 1523. Bucer would lead the Reformation in Strasbourg for the next twenty-five years. Between 1523 and 1549, when he was once again exiled, Bucer would be a key figure in the Protestant Reformation. One of the central disputes during the time of the Reformation concerned the doctrine and practice of the Lord’s Supper. Very early on, a rift appeared between Luther and the Swiss Reformers, such as Huldrych Zwingli and Johannes Oecolampadius. This division created not only theological and ecclesiastical problems, but political problems as well. The armies of the Holy Roman Emperor Charles V were a threat to the cities and regions that had converted to the cause of Reformation. Disagreements over the Lord’s Supper among Protestants led not only to ecclesiastical divisions but to political divisions as well, divisions which weakened the Protestant cities politically and militarily. Bucer devoted much of his energy to the task of finding a way to reconcile the Lutherans and the Swiss. His efforts resulted in several important documents. He co-authored, for example, the Tetrapolitan Confession in an attempt to effect reconciliation. His views of the Lord’s Supper influenced Calvin, who also took a mediating position between the Lutherans and Zwinglians. In his biography of Bucer, Martin Greschat discusses these and many more events, including Bucer’s last years in England after being exiled from Strasbourg. Whether one admires Bucer or finds his efforts at unification theologically misguided and/or naïve, this biography is well worth studying. There are many works on the Reformation as a whole, and some of these works demonstrate outstanding scholarship. They all, however, tend to suffer from the same inevitable defect. Histories of the Reformation as a whole are forced by their very nature to cover a great deal of material, and this prevents them from focusing intently on the day to day work performed by those in the midst of this defining moment in history. Such general works are necessary, but they should be supplemented with books such as Greschat’s biography of Bucer. This is necessary because many students of the Reformation view the writings and disputes of the Reformation in a vacuum. They do not take into account how much political, social, cultural, and other factors affected the Reformers and their work. Greschat does a magnificent job drawing readers into the world of the sixteenth century. Readers of this biography are given a fascinating glimpse of these tumultuous years from the perspective of one significant player in the events. We see the political maneuverings of princes, city councils, kings, reformers, and bishops. We see the effects on the Reformation of economic depressions and deadly diseases. We see the day to day gains and losses of those who sought to call the Church back to Scripture. Bucer was certainly not perfect, and Greschat points out his flaws. He was, however, a fascinating and important part of the sixteenth-century Reformation. Thankfully, Martin Greschat has provided the church a fine biography of this forgotten Reformer.